Â§ 1. “Various and sundry” is an idiom my mother used to say a lot … I haven’t heard it in years and years, and then it popped into my head as a title for today’s post. It’s a phrase that probably started as a joke (because the two words are redundant) and somehow caught on and became a standard expression, losing in the process the original humorous intent. Â§ 2. In this regard, it reminds me of another common phrase: “the shot heard ’round the world.”Â What do you think of when you read this phrase? Recently, when the former baseball broadcaster Russ Hodges died, I read a very interesting article on CNN about the way that Hodges’ most famous call was preserved for posterity. In 1951, the San Francisco Giants won the National League pennant in a playoff against the Los Angeles Dodgers that was decided by a walk-off homer by Bobby Thomson. Hodges famously screamed into the microphone “The Giants win the pennant! The Giants win the pennant!” Everyone knows this now, but back in those days you didn’t have ubiquitous TV and Internet coverage of every sporting event. If it hadn’t been for one fan who happened to make an old reel-to-reel tape of the game, I suspect that Hodges’ words would have been long forgotten. Â§ 3. But this is a chess blog, and my original intention was to write about “various and sundry” chess news items! How quickly I get sidetracked. The sixth season of the U.S. Chess League has begun. I’m not sure if anybody has pointed this out, but the U.S. Chess League will soon surpass, if it has not already surpassed, the longevity of its predecessor, the telephone-based National Chess League of the 1970s. Speaking of historical amnesia, aside from Mark Ginsburg’s excellent blog posts (one of which I just linked to), I could not find any information on the Internet about that league. When did it begin? When did it draw its last wheezing breath? My best guess is that it started around 1974, because one of the teams was named the Washington Plumbers. This was a reference to the “plumbers” that became infamous during the Watergate scandal, which climaxed in 1974 with the resignation of President Richard Nixon. If the league had started in 1975 or later, I think it’s very unlikely that the name “Washington Plumbers” would have had as much pop-cultural resonance. As for when the league ended, I would have guessed 1976 or 1977, because that’s about the time I stopped being aware of it. However, Ginsburg writes in his blog about matches as late as 1979, so maybe the league actually managed to survive six seasons. I highly doubt that it went longer than that. I consider it a slam-dunk certainty that the U.S. 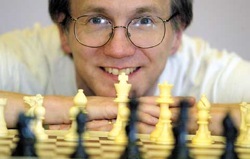 Chess League will top that record, given that the league is growing in popularity. And possibly it has already broken the record, if the previous league only lasted five seasons. The reason for the USCL’s success is pretty obvious. The Internet is a much more convenient way to play long-distance chess than the telephone, and it also creates terrific opportunities for spectating. Glitches like matches decided by a slip of the mouse do sometimes happen, but overall the USCL is one of the best things going in American chess. So far, the “stacked” St. Louis team has been struggling. Chess is played on the board, not on paper! After four matches, the Arch Bishops are just in the middle of the pack, with a 2-2 record. Come to think of it, the Arch Bishops remind me of the Miami Heat basketball team. For people who don’t follow basketball, the Miami Heat this summer stockpiled three of the best players in the NBA — LeBron James (two-time MVP, the basketball version of Hikaru Nakamura), Dwyane Wade (former scoring leader, the basketball equivalent to Yury Shulman), and Chris Bosh (top-tier player though not quite in the “superstar” category, like Ben Finegold). The rest of the team will be a bunch of nobodies and aging veterans hoping for one more title. Everyone is predicting that Miami is going to be the best team of all time, that they’re a lock to win the championship, etc. Maybe yes, maybe no. Certainly it will be fun to root against them! Â§ 5. Meanwhile, the breakout success of the early season has been the Arizona Scorpions, with a 4-0 record. That seems a little bit surprising, considering that they lost their top player, 2010 U.S. Open Champion “Ale-Alejandro” Ramirez, to the Dallas Destiny. But this week, in an exciting grudge match with the Destiny, Arizona prevailed by a score of 2Â½-1Â½. Ramirez didn’t play, and unfortunately I don’t know why. Seems as if Arizona caught a little bit of a break there. Â§ 6. Of course, I am rooting for my “local” team, the San Francisco Mechanics. Over the five seasons of the league, they have been the most consistently good team (slightly ahead of the Boston Blitz both in match points and game points), although they have only managed to win the championship title once. A big part of their success is their consistent ability to find strong, underrated junior players for the lower boards. First it was Daniel Naroditsky, who once was a fourth board and now has graduated to sometimes playing second board; then it was Steven Zierk, who has graduated from fourth board to third, and now it is Yian Liou on fourth board. If you’re wondering, “Can the Mechanics keep them coming?” the answer is absolutely yes. In a year or so they’ll have Evan Sandberg, Samuel Sevian, Kyle Shin, and probably others whom I don’t know about yet. So far this year, the Mechanics are in second place in the Western Division with a 3-1 record, with a loss to third-place Chicago and wins over Dallas, Seattle, and Miami, which have all historically had strong teams. Â§ 7. My personal chess plans have changed a little bit. I was planning to play next at the Berkeley International, to be held in January, but then I realized that it conflicts with the national mathematics meetings. For professional reasons I have to go to the math meeting. I am very disappointed to have to miss a strong event like the Berkeley International, but priorities are priorities. I guess that’s one reason I’m not a 2300 or 2400 player. Anyway, now I might re-think my plan of taking a break from tournament chess for the rest of the year. With no tournament to look forward to in January, I might play in the Western States Open in October, or in a local tournament over the Thanksgiving weekend.